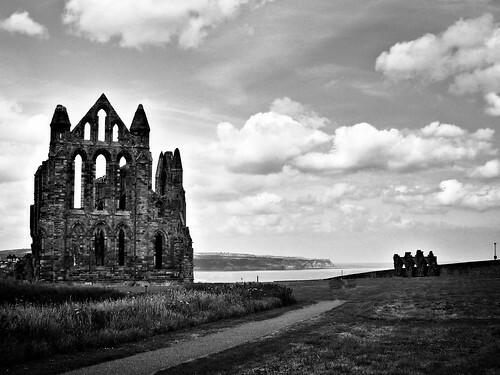 The abbey ruins at Whitby, Yorkshire. Photo by Rick Morley. I love church ruins. I love traveling through the English, Scottish, and Welsh countrysides and visiting Abbey ruins there. They can be hauntingly beautiful. The Benedictine Abbey on the Holy Isle of Lindisfarne. The Cistercian Abbey at Fountains. The Abbey Ruins which are attached to Holy Rood Palace in downtown Edinburgh. When maintained correctly, and kept away from intruding modern architecture, they are just stunning. Every once in a while, when the crowd gets quiet, you can almost picture yourself sitting in that place 500 years ago bathed in the glow of candles and the scent of incense. But, at the same time, there is something profoundly sad about them. For, everything you see there is just a shadow of what once was. Something that was once complete and holy, was desecrated and thrown down. The holiness of life that was exemplified in community there is gone – only to be replaced by a book shop stocked with tea pot cozzies, herb (pronounced HH-erb) fragranced soaps, and prawn crisps. There’s something sad about that. Which is why, when God says in Isaiah 61: “They shall build up the ancient ruins, they shall raise up the former devastations; they shall repair the ruined cities, the devastations of many generations,” there’s something about it that feels so right. God wasn’t, of course, speaking of the abbeys in Britain – he was speaking of Jerusalem. The Holy City. The City of David. The place that once housed the Ark of the Covenant, and thereby the very Presence of God himself. It was in ruins, but those ruins will be “built up” and repaired. Not in an act of historical refurbishment, but in a new way – in a new form. And, far more important than the ruined buildings, was the faith of Israel that was in tatters. It was a renewed faith and hope that the God who had brought them out of the fiery furnace in ages past would once again work his wonders. It doesn’t take much looking around these days to see things in ruins. Economies. Jobs. Lives. Marriages. Childhoods. Educations. But, our God is a God who builds up and restores. Who makes all things new. And, he’s the God who has invited us along, to pick up a hammer and get to work rebuilding and refashioning the world around us, and the faith that was been entrusted to us and handed down to us by the saints. Where are the ruins in your community? In your church? On your block? Where are the places that you see, and instantly identify something as sad. So, so sad. Because right there is where God is at work. And, right there is where God needs us. It’s where he plants us. To be agents of rebuilding, refashioning, and hope. Even amidst the ashes. And the crumbling, gnarled, and ancient stone. Whenever I see those ruins, I mourn over why they were destroyed. No doubt. Sad moment in history. However, it’s far more sad for me to see fully in-tact cathedrals in England/ Europe which are as dead as any ruin.